“Content” first made its appearance in Japanese as a loanword in the mid-90s. It refers to information products such as movies, television shows, books, CDs, and DVDs. Even the government has pinned its hopes on this 15 trillion yen industry and has announced a goal to expand it by a further 5 trillion yen. However, for these past few years the market has been contracting and areas such as anime and music have been continuously pressed by competition from Korea. What was the best content policy of all time? I believe it was the moment in 1957 when 34 private TV stations were simultaneously granted licenses, thus expanding the television industry and creating what would come to be the content leaders in Japan. What is needed in order to ensure that content stays robust is not meticulously divvying out subsidies, but rather a dynamic policy plan that opens up the airwaves and allows new media to take shape, and the political will to make it happen. The content market may have contracted, but social media services are undergoing growth. Whether it’s twitter, Facebook or NicoNico Douga, social media services facilitate communication. In other words, these are services which allow individual amateurs to produce their own content. 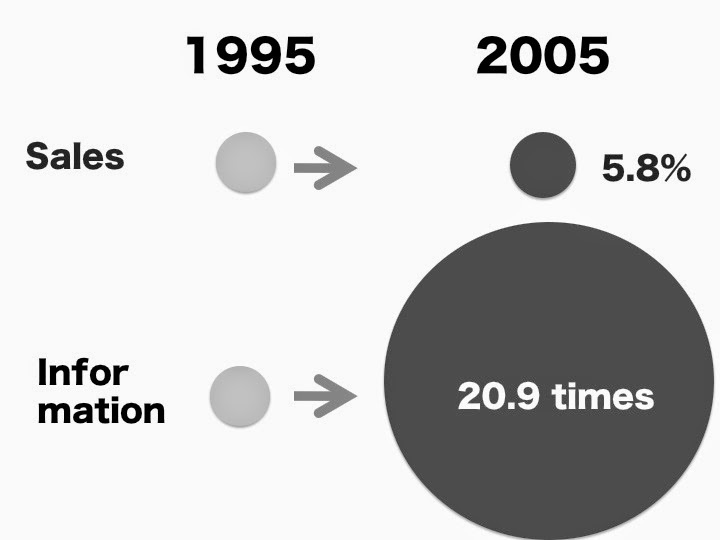 What has been the biggest effect of digitalization? I would point to the increase in the number of content producers. As anyone became able to send information using their computer or cellphone, the amount of information has increased explosively. In the decade following 1995, the content market expanded 5.8 percent. In that time, the amount of data being sent and received in Japan increased by a factor of 20.9. Even when industry is not experiencing any growth, content is being actively created. Individual content as a means of communication can be counted as part of the telecom industry. An individual making and distributing their own content is creating their own market, defined by the cost of transmission, and which they are responsible for structuring. The telecom market is worth 15 trillion yen yearly. Digitalization will cause the 14 trillion yen content market and the 15 trillion yen communications market to merge. Deciding how to redesign the approximately 30 trillion yen market that will result has become the task of public policy. What we want is a policy package that is fixed around the axes of content and social media. First, we make it so money circulates throughout the content industry, by abolishing corporate taxes on the content industry and establishing a tax system that encourages donations towards cultural activities. We protect and encourage the ability of people to participate in social sharing services by promoting Comic Market and Hatsune Miku and translating pop culture websites with the potential to reach overseas audiences into several different languages. We guarantee the means of distribution. Buy up foreign media frameworks aimed towards Japanese content; in other words, television channels. Copyright is also a problem. Create a special section of copyright law that will force us to try a new business model. There are any number of ideas. What we really need is the political will to put them into practice.